As part of its undertaking to expand access to Government Archives, Akevot is working to map the various impediments to public access to the documentation held in the government archives, to research the reasons they exist and act to remove them to enable the public to exercise its right to access government archives and their holdings. Alongside preserving the records stored in it, the archive’s primary role is to provide the public with access to them. 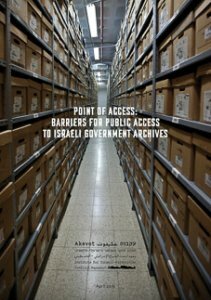 Akevot’s report Point of Access summarizes the findings of extensive research regarding the various barriers to access to Israel’s government archives. The report surveys the findings and presents recommendations for improving access and having the Government Archives fulfill their legal obligations. The report shows that due to the Government Archive’s policies, a paucity of the materials preserved in the Government Archives is accessible for public consultation: a mere one percent of all the materials in the Israel State Archive (ISA) and in the IDF and Defense Establishment Archive (IDEA). The report findings address, inter alia, the barring of public access to the lion’s share of documentation whose restricted access period has expired; routine extensions of barring viewing of archival records without legal authority; allocating limited resources for making materials accessible for viewing; failing to present complete catalogues to the public; inexplicable and nontransparent conduct by the archives in response to access requests; and the sealing of the GSS (Shin Bet) and Mossad archives. The research on which the report is based includes interviews with numerous archive users, conversations with the state archivist, the director of the IDEA and other employees, consultation with experts in the field, information provided by the Prime Minister’s Office and the Ministry of Defense in response to requests in accordance with the Freedom of Information Law, and other sources, among them: the case-law regarding access to archival materials, State Comptroller reports on the archives and various academic and other articles. The first chapter of the report is dedicated to surveying the pertinent legal statutes: The Archives Law and the Access Regulations, court rulings in the matter from the last decade. The next three chapters cover the state of public access to materials in the Israel State Archive (ISA), IDEA and the Shin Bet and Mossad archives. The fifth and last chapter focuses on the importance of access to government documentation for the protection of human rights, and examines specific impediments to access materials related to human rights that are routine in the Israeli Government Archives. The report paints a bleak picture: The entities that control access to archival materials regularly disregard their legal obligations, creating a reality in which the Government Archives in Israel do not uphold their obligation to allow public access to government documentation. The value and role of the archive, as an institution that documents human and societal activities, are rooted in the connection between recognition of the past and of the present. The Government Archives contain documentation created and collected by public servants and elected officials for the benefit of the public, and with its funds. This material is designed to return to its rightful owners – the public at large – when the conditions prescribed by law are met. The public’s ability to enjoy access to the archive and the records it holds is an essential part of exercising the Right to Know, the right to access information regarding government conduct and operations. That is why it is also a critical component of freedom of speech; it is necessary for the existence of free and independent research, as well as to enable members of a society to become familiar with its sources and to decipher its current events. Access to the archive is also critical for the protection of human rights: Access to documentation regarding violations of human rights is part of the mechanism of accountability the state is obligated to provide the public and can assist in attaining remedy for those whose rights have been violated, and in preventing future violations.